Sleek, bold and powerful, the Autographed Synyster Gates Guitar Satin Goldburst Custom S is an instrument like no other. Never one to stand still, after over a decade of playing his Schecter Synyster Custom signature guitar all around the world, Synyster Gates had collected a few ideas about how to make it even better; The new, upgraded Schecter Synyster Custom-S guitar is the culmination of this effort. Updated appointments include new ergonomic contours for increased comfort over long sets, glow-in-the-dark side-dot position markers to light your way on the darkest stages, and an upgrade to the Floyd Rose 1500 bridge system for precision dive-bombing pleasure. Not stopping there, the guitar also comes installed with Synyster’s own signature US-wound Schecter Custom Shop bridge pickup; Utilizing three precisionmilled Ceramic 8 magnets, Syn’s new powerhouse pickup pushes almost 18k DCR while retaining incredible detail and dynamic response, and is hand-potted to eliminate squeal and feedback, even at ungodly volumes. To top it off, a Sustainiac pickup in the neck position offers mind-melting expressive capabilities, with 3 switchable infinite-sustain options. 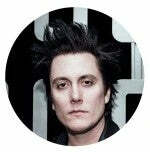 Complete with Syn’s personal stylistic touches, the end result is an axe tailor-made for unleashing global sonic mayhem. And now comes signed by Synyster Gates himself. Take any stage with confidence with the Synyster Custom-S electric guitar. Featuring a Mahogany wood body drenched in a brilliant Satin Gold Burst finish, this sleekly designed guitar performs as well as it looks. The Synyster Custom-S is part of Synyster Gates' line of personal guitars and it mirrors the same instrument he plays on stage with Avenged Sevenfold. With Gold Grover tuners, hardware and 24 X-Jumbo frets, the Synyster Custom-S is a guitar specially designed for everyone interested in honing in their craft, no matter their age and skill level. A vividly unique instrument, the Synyster Custom-S features an Ebony fretboard adorned with Gold Pearloid 'SYN' and 'Death Bat' inlays. With special glow-in-the-dark fret markers, performing on stages with dark lighting conditions is a breeze. Mahogany neck construction with three Carbon Fiber Reinforcement Rods are included that make for a solid, reliable design. Used and inspired by legendary Avenged Sevenfold guitarist Synyster Gates, the Synyster Custom-S is a masterfully crafted instrument designed to bring your performance to new heights. After years of playing the first iteration of my classic pin stripe signature guitars, Schecter approached me to explore a possible limited run of some modified versions of the O.G. signature model. I was definitely ready to expand the line and make a few modifications that would compliment the current evolution of my style, and once we did, they were here to stay. Firstly, I wanted to do a satin finish on the body and neck for a couple of reasons. I had been integrating a lot more tapping technique into my playing, and the satin finish allows for super smooth movement of the tapping arm while resting on the body. The other was the “matte” look that I had been really into. Second, I wanted a more narrow neck radius that allowed me to struggle less on stage when standing with the guitar hanging a little lower. This allows me to reach and stretch a little further that before. Now, I should point out that if you are in the studio, or typically hang your guitar at a “reasonable” height, you don’t need this feature, but seeing how I am an “UNreasonable” man and wish do things at an unreasonable level, this feature suited me well. I also love the glow-in-the-dark fret markers on the side of the neck. Often times I start songs like “Buried Alive” or “Nightmare” in complete darkness and this helps me to execute the beginning of these songs with ease and confidence.